The big league club has lost nine of 11, but there's good news on the horizon for Toronto Blue Jays' fans. Jeff Hoffman is back, and 12 months on the shelf haven't harmed his stuff. The Blue Jays' No. 3 prospect and the ninth overall pick in the 2014 Draft made his pro debut with Class A Advanced Dunedin on Wednesday. He allowed four earned runs -- all in the second inning -- over five frames, but didn't factor into the decision in a 6-5 win over Tampa. 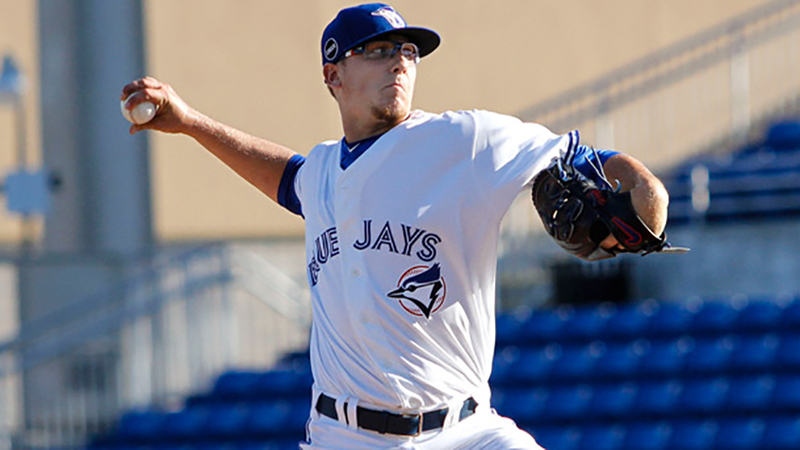 The 22-year-old worked 92-99 mph with his fastball and also threw his curveball and changeup, according to Dunedin pitching coach Vince Horsman. He struck out three and didn't issue any walks. "Everything was good, I thought," Horsman said. "He was a little excited, made some mistakes up in the zone. His fastball was good. His curveball was good. His composure, it was his first game competition, he handled that well. He had good mound presence and composure. Aside from one bad inning when he elevated in the zone, he did a nice job." Hoffman rocketed to the top of Draft boards last year and was rumored to top the Astros' shortlist of options for the first overall pick. He suffered an elbow injury and underwent Tommy John surgery on May 14, though. The operation caused him to fall to the Blue Jays. MLB.com's No. 80 prospect has spent the past year recovering from the operation. He pitched in a handful of extended spring training games over the past month in preparation for Wednesday's debut. Hoffman retired the first three hitters he faced. Yankees' No. 21 prospect Abiatal Avelino led off with a flyout to right, then Hoffman then struck out No. 20 Tyler Wade and got No. 11 Miguel Andujar to ground out to second. The right-hander hit a snag in the second, allowing consecutive hits to Mike Ford and Mark Payton. Both runners ended up scoring, and then Kyle Higashioka followed up with a two-out, two-run homer to left. Tampa finished the inning with a 4-3 advantage. "I think just the overall adrenaline, it was his first time in over a year that he's pitched in a meaningful game," Horsman said. "It means something. It counts now. I think as he progresses through the season now, he'll get a better feel for his pitches. He'll just relax a little bit and not get so fired up. I don't blame the kid, though. I would be too." Hoffman blanked the Yankees from there. In the third, he allowed a leadoff single to Wade, but the Yankees infielder was caught stealing during the next at-bat. Andujar and Ford then popped out and struck out respectively. In the fourth, Payton led off with a single, but was also caught stealing. Hoffman induced a groundout and a flyout to escape the frame. The East Carolina product finished his day by striking out Andujar with a curveball in the fifth. "The last batter he faced, he punched him out on a curve, his best of the night," Horsman said. "It disappeared out of the strike zone and got a poor swing. He's a kid that really has the ability to spin the baseball. "As far as that's concerned, we're not worried about him. He has a feel for that kind of stuff." The pitching coach said Hoffman mixed some solid curves with a couple duds. The same was true of Hoffman's changeup. Horsman said he threw the pitch too hard out of the gate -- possibly a side effect of the early adrenaline -- but got a feel for the pitch as the game went on. "He used it a little bit tonight," Horsman said. "Later in the game, he threw some good ones and got some better results. It's just all feel. Getting in that game feel for stuff, where you're in the game, not just throwing live [batting practice] or in extended, just getting the work in, so to speak." Players from his alma mater were among those supporting Hoffman in the stands. East Carolina topped UCF in walk-off fashion in Clearwater, Florida, on Wednesday afternoon, then bused to Dunedin to watch their notable alum make his pro debut. Avelino hit a solo home run off Dunedin reliever Jeremy Gabryszwski in the eighth inning to tie the game. Dunedin won the game on Dawel Lugo's walk-off single to right in the ninth. The Blue Jays' No. 16 prospect finished 2-for-5 with a double, lifting his average to .233 on the season.